Anand managed to play out a draw with world number one Magnus Carlsen in the fifth round of the Altibox Norway Chess tournament. 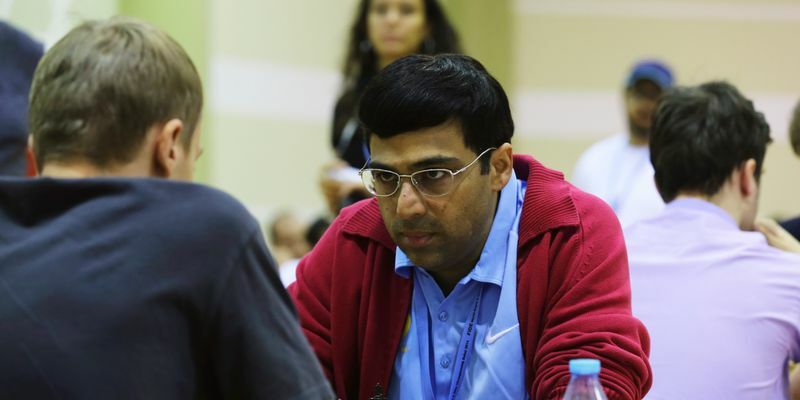 Interestingly, Anand has played six games so far and played out six draws in all, the last one coming against Azerbaijan national Shakhriyar Mamedyarov in the sixth round encounter. Five-time world champion, Viswanathan Anand’s hunt for an elusive win continued as Mamedyarov held the Indian off to yet another draw at the Altibox Norway Chess tournament, which is shaping up to be the toughest tournament of the year so far. Anand took his tally in the tournament to 2.5 points as the game against Ding Liren, who withdrew due to injury, was declared null and void. The Indian legend still has three more games to play in Norway and technically he is just a half point behind Carlsen, who was handed a surprise defeat at the hands of American Wesley So. Carlsen suffered his first defeat of this year after a streak of 37 undefeated classical games. The reigning world champion took some positives back from the game from as he was still tied for the first spot with Wesley. But Wesley has three games remaining while Carlsen has just two more games to play in the nine-player tournament in Norway. Meanwhile, Anand was on 2.5 points as he shared the fourth spot with American duo of Hikaru Nakamura and Fabiano Caruana, Sergey Karjakin of Russia and Mamedyarov. France's Maxime Vachier-Lagrave is at the bottom with two points after six rounds. Viswanathan Anand (IND, 2.5/5) drew with Shakhriyar Mamedyarov (AZE, 2.5/6); Wesley So (USA, 3/5) beat Magnus Carlsen (NOR, 3.5/6); Hikaru Nakamura (USA, 2.5/5) drew with Maxime Vachier-Lagrave (FRA, 2/5); Levon Aronian (ARM, 3/6) drew with Fabiano Caruana (USA, 2.5/5).